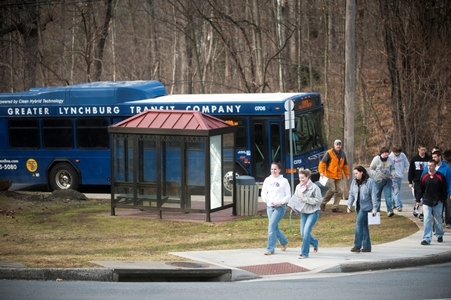 LC ridership on the Greater Lynchburg Transit Co. (GLTC) buses climbed to 4,874 during the spring semester (January-April) this year compared to 4,373 in spring 2011. Members of the LC community also boarded the buses 6,801 times between Aug. 1 and Dec. 1, 2011, compared with 4,358 boardings during the same period in 2010, according to GLTC data, for a total of 11,675 boardings. The College started offering free rides to students, faculty, and staff with a valid college ID the carbon footprint of the campus community in fall 2010. Dr. David Perault, associate professor of environmental science, has created a web page to help demystify the bus schedule.